I made my second meal from Blue Apron and I think these meals just keep getting better and better! 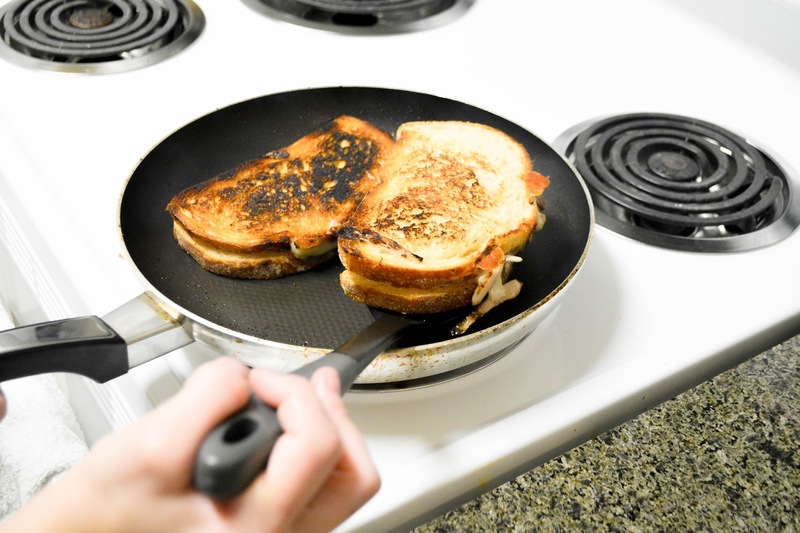 This meal is called Fontina & Preserved Lemon Grilled Cheese Sandwiches. Anyone who knows me knows I'm a sucker for some grilled cheese. Fun fact of the day, I make the best grilled cheese known to man. I must admit that as delicious as this was, sugared lemon just doesn't belong on a grilled cheese. Now that being said, I still enjoyed the meal and definitely want to make it again, I just would leave the lemon dressing for the salad. 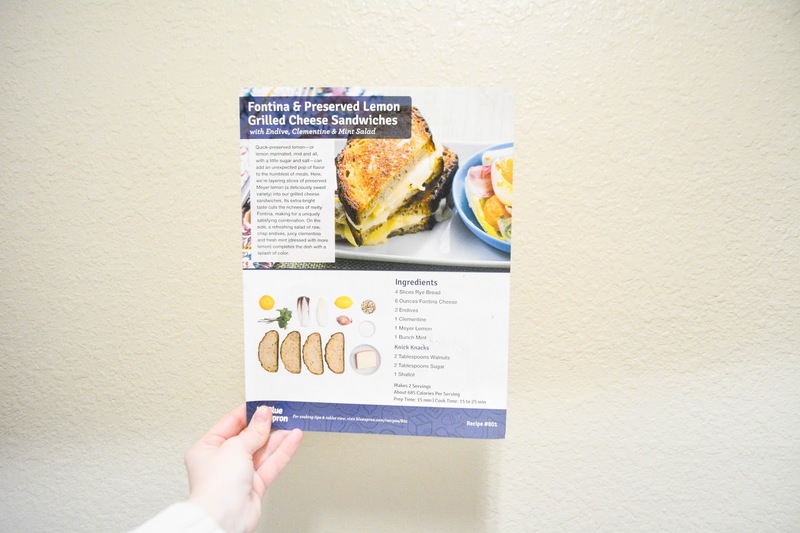 As I said before, Blue Apron sends you all the ingredients and step by step instructions on how to make meals that they send right to your door! It's super convenient, affordable, and fun. "Quick-preserved lemon- or lemon marinated, ring and all, with a little sugar and salt- can add an unexpected pop of flavor to the humblest of meals. 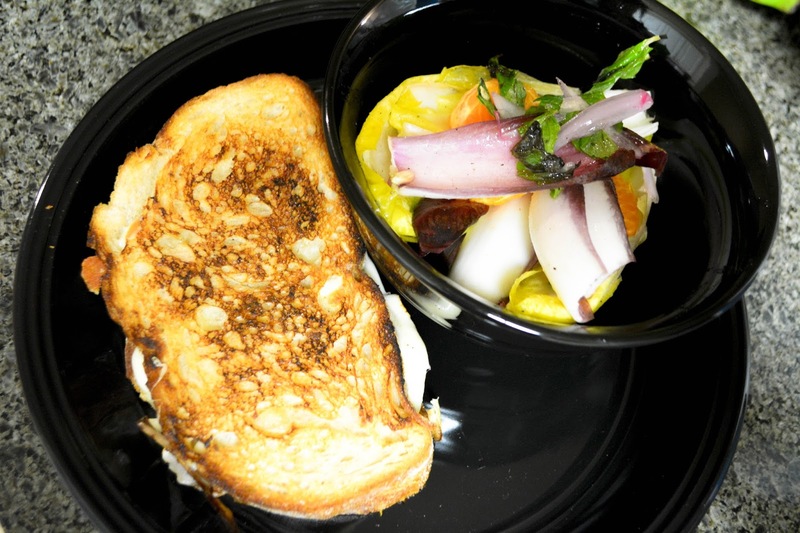 Here, we're layering lives of preserved Meyer lemon (a deliciously sweet variety) into our grilled cheese sandwiches. 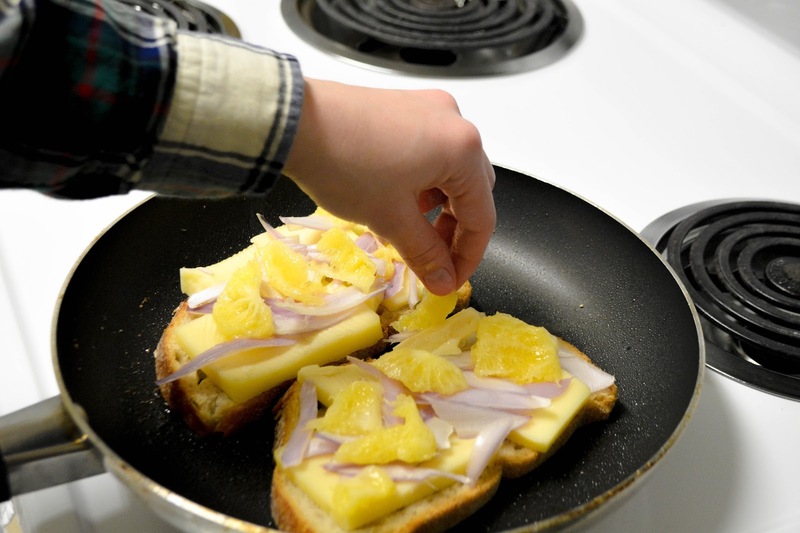 Its extra-bright taste cuts the richness of the melty Fontina, making for a uniquely satisfying combination. On the side, a refreshing salad of raw, crisp endives, juicy clementine and fresh mint (dressed with more lemon) completes the dish with a splash of color." If grilled cheese is your thing like it is mine I highly suggest that you give this one a try. I listed below the ingredients and steps to make it. It's healthy, low in calories and vegetarian! (For meat lovers I suggest adding some cooked ham to yours). 1) Prep the ingredients: Wash and dry the fresh produce. Quarter and dressed the lemon; thinly slice 2 of the wedges crosswise, leaving the remaining wedges intact. Roughly chop the walnuts. Cut off and discard the ring of the cheese; thinly slice the cheese. Peel and thinly slice the shallot. Cut off and discard the root ends of the endives; separate the leaves. Peel the clementine; separate the segments. Pick the mint leaves off the stems; discard the stems. 2) Marinate the lemon: In a bowl, combine the sliced lemon, sugar, and a big pinch of salt; toss to throughly combine. Set aside to marinate, stirring occasionally, for at least 5 minutes. 3) Toast the walnuts: While the lemon marinates, heat a medium, dry pan (nonstick, if you have one) on medium-high until hot. Add the walnuts and toast, stirring occasionally, 2 to 3 minutes, or until lightly browned and fragrant. Transfer to a bowl. Wipe out the pan. 4) Assemble the sandwiches: Place the bread slices on a clean, dry work surface. 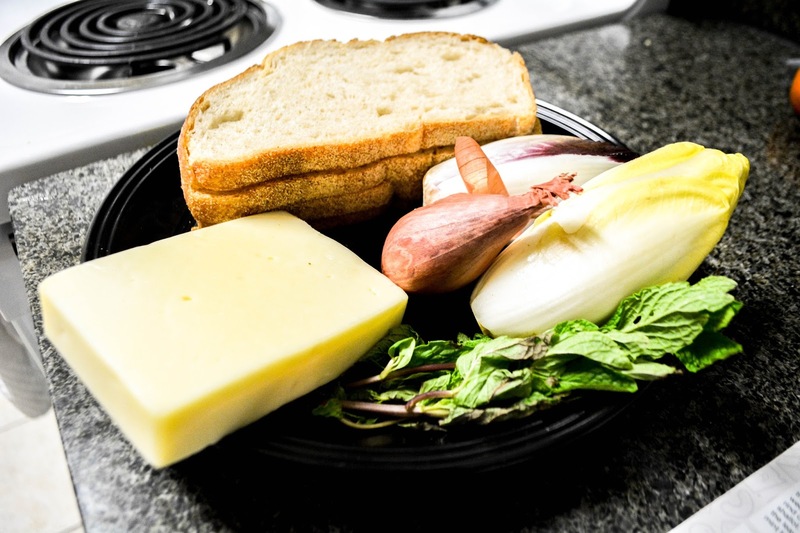 Divide the cheese and as much of the shallot as you'd like (you may have extra shallot) between 2 of the bread slices. Top with as much of the marinated lemon as you'd like (reserving the marinating liquid); season with salt and pepper. Complete the sandwiches with the remaining bread slices. 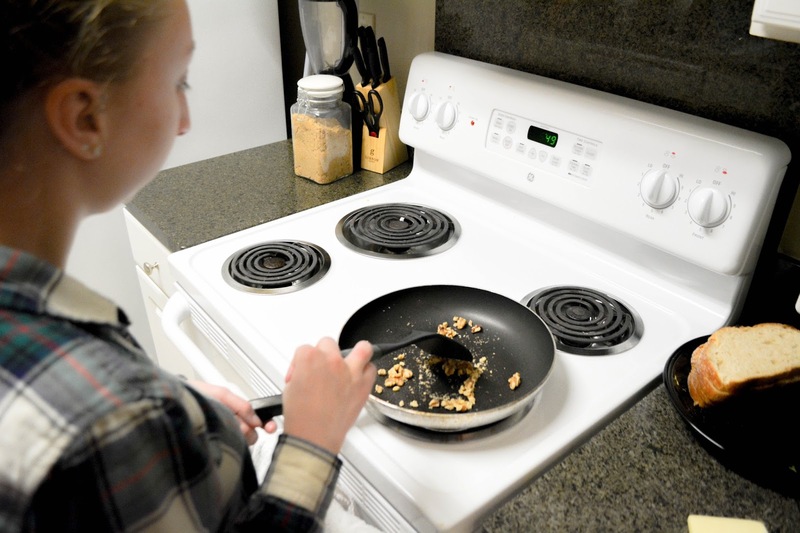 5) Cook the sandwiches: In the pan used to toast the walnuts, head 2 teaspoons of olive oil on a medium-high until hot. Add the sandwiches and cook 2 to 4 minutes per side, or until the bread has browned and the cheese has melted. (If the pan seems dry, add an additional teaspoon of olive oil before flipping.) Transfer to a cutting board. 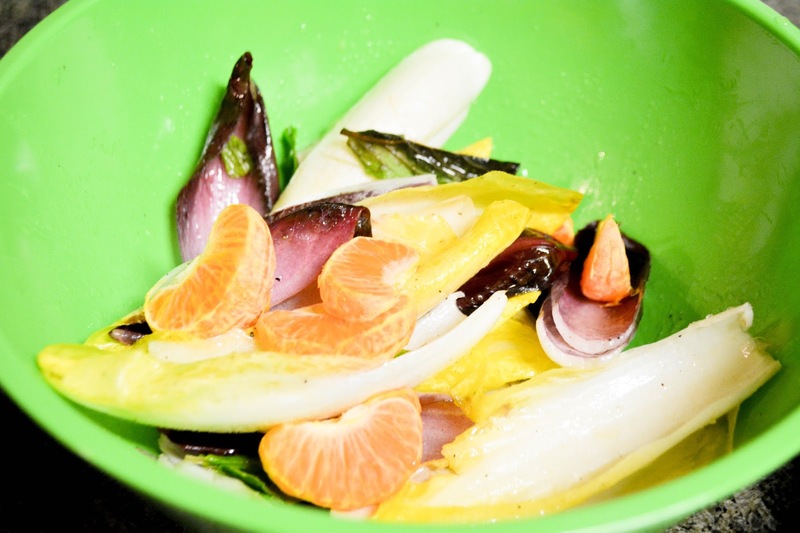 6) Make the salad & plate your dish: While the sandwiches cook, in a medium bowl, combine the endives, clementine, mint (thinly slicing just before adding), toasted walnuts, the juice of the remaining lemon wedges and 1 tablespoon of the reserved marinating liquid; season with salt and pepper. Drizzle with olive oil and toss to combine; season with salt and pepper to taste. 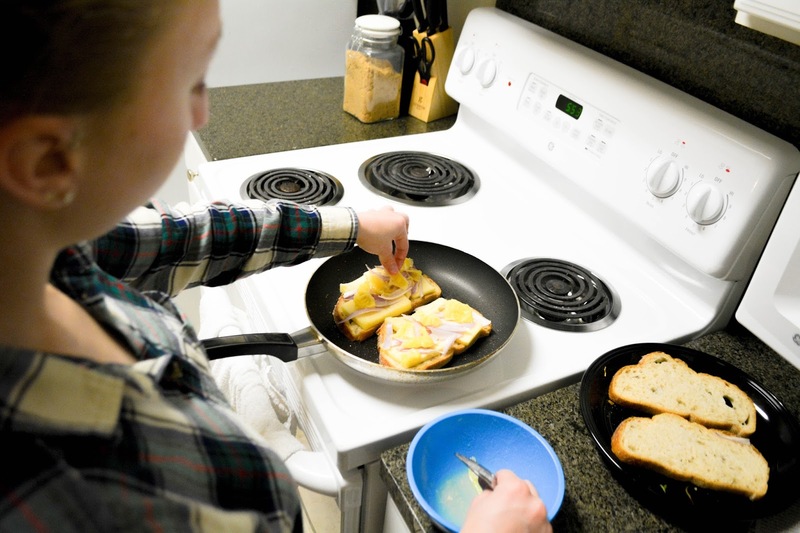 Cut the cooked sandwiches in half and divide between 2 plates. Serve with the salad on the side. Enjoy! There you have it folks. Everything you need to try out this recipe, which you definitely should if you're looking for a quick, healthy, and delicious meal. If you try it out let me know what you think!